The worldwide Internet is a critical tool in this information age. But it can also lead to widespread misconceptions, which this article attempts to clear up. In my spare time I’ve been known to peruse various websites, newsgroups, and other online forums devoted to all things loudspeaker. Over the years I’ve learned quite a bit, gaining further in sights into the art and science of speaker building from both luminary and amateur enthusiasts alike. And if you, like me, spend any time following the variegated tracery of threads which make up these various online resources, you’ll also know the noise-to-useful-information ratio can be very large indeed. I’ve often seen it happen that an idea or concept, lacking little or no technical merit or validity, is promulgated as truth. I’ve elevated to the rank of “myth” those seemingly inevitable items that pop up year after year. I’ve looked at some of my favorites under the objective light of hard science, and I’d like to share the outcome of my own investigation into these favorite myths of mine. Quite a large amount of online text has been devoted to this item in the forums I mentioned earlier. Reading the various discussions raging back and forth between contributors over the years, I get the general sense that most folks make too much of the amplifier’s contribution to the total system damping factor—and its effect on system performance. 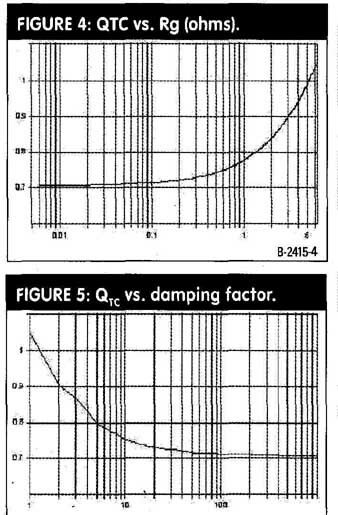 Damping factor (DF) is defined as the ratio of the load impedance (usually taken as 8 ohm) to source impedance. It is a dimensionless figure of merit and therefore has no units ascribed to it. In practical terms, when applied to an amplifier, it indicates to what degree the amp can dissipate the energy generated by a driver’s voice coil as the coil’s post-impulse motion decays to zero: thus is the mechanical vibration electrically damped. But focusing solely on DF as deter mined by an amplifier’s output resistance (Hg) is simply too narrow in scope; its Rsource, the sum of Rg, cable resistance (Rcable), crossover network component resistance (Rcomponent), and Revc (voice coil resistance) determine the true DF as seen by the driver. In fact, focusing on Hg alone also ignores the single largest contributor to DF: the driver’s voice coil. To resolve a clearer picture of DF, I ran a series of simulations to determine to what degree various damping factor values as determined by Revc, Rg, Rcable, and Rcomponent affect system response performance at resonance frequency. … and a Qtc = 1/v(2), (Butterworth B2 alignment) producing a maximally flat response, with zero peak at resonance. Although DF is typically at a load impedance value of 8-ohm, I used Revc = 6.212, which was the Revc parameter value of the driver I modeled (KEF B139). If you’re more comfortable thinking of DF in terms of the usual 8-ohm load, convert the given 6.2-ohm-based Hg figure by multiplying the given values by 1.2903. At any rate, in running the analysis, some interesting trends emerged from the data generated by the simulations (Fig. 1). As I mentioned earlier, the Hg, or amplifier output resistance, in actual practice is only part of Rsource; all three components of Rsource, along with Revc, combine to affect DF. Of all resistance component values, however, Revc is typically by far the largest and therefore has the greatest effect on DF. Plug Qec’ into the well-known equation used to calculate Qtc. A cursory examination of these formulae shows that as Rg increases, so too does Qtc’, and with the increase in Qtc’ comes an increasing response peak at resonance. And, of course, adding the other two components that make up Rsource, Rcable, and Rcomponent produces even larger changes in Qec, Qtc, and system response at resonance (Figs. 2-5). The question is, at what point does the effect of declining DF become audible? Looking at the first dataset, which I generated considering Rsource, it would appear that only in the very worst cases do these changes enter the realm of possibly audible. And setting the upper value limit of Rsource = Revc is certainly an extreme case (Table 1). Noting the position of Rsource in the Qec’ equation tells you that keeping it as low as possible is helpful, but only modestly so given that Revc, under typical circumstances, is much, much larger. 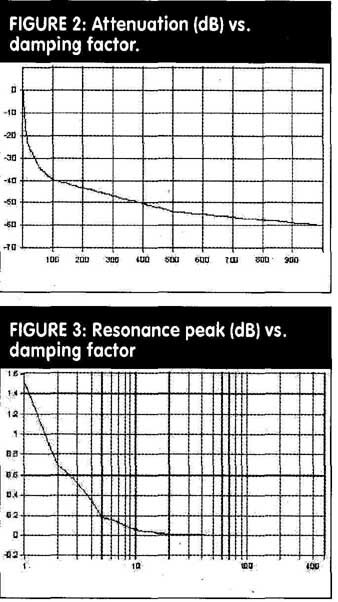 The key to understanding the true nature of DF is realizing that it’s the total resistance seen by the driver’s motor coil that counts and that Revc is—by far—the largest, single most important contributor to the total resistance value of the amp/cable/component/voice-coil circuit. Because the value of Rsource tends to be << Revc, Rsource doesn’t much change the degree of damping the driver experiences at resonance owing to its own Revc. Why? Damping is energy dissipation—here in the form of direct. conversion of electrical power into heat, with the end result said energy is no longer stored in the system. Typically, 95%+ of the power supplied by the amplifier winds up as heat generated by the voice coil. 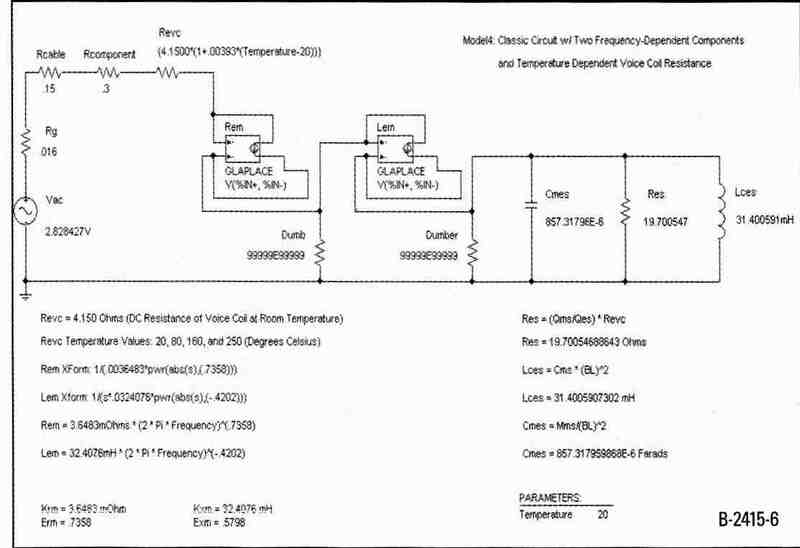 To get a clearer picture of where and to what degree dissipation occurs with in the amp/cable/component/voice-coil circuit, I ran a simulation of a driver based on a circuit (Fig. 6), the schematic of which some of you may recognize an earlier Speaker Builder article (“Pspice Probes a Loudspeaker’s Evolution,” 1/99, p. 26). In that article, I demonstrated how to produce an accurate model (with both temperature- and frequency-dependent components) of a raw driver using PSpice. I’ve added Rg, Rcable, and Rcomponent values, retaining the original model Revc value of 4.15 found in that earlier article. I then probed for power dissipation at each of the four components to see how and where power was being dissipated. If you’d like to experiment with the model using your own circuit editor/analyzer, I’ve included the netlist generated by PSpice (Fig. 7). 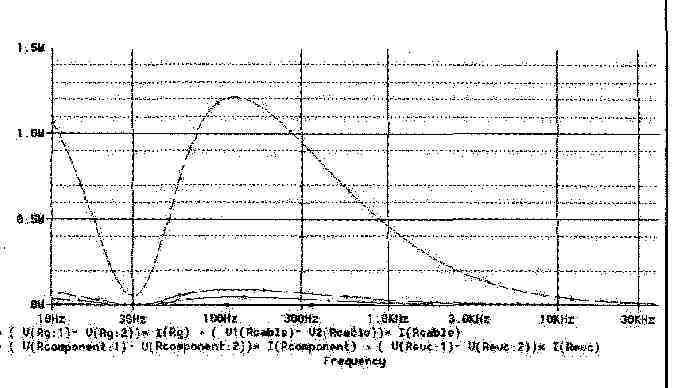 Once I ran the simulations it was easy to see from the generated output graphs that, indeed, the majority of dissipation—and therefore damping—was taking place in the Revc component of the circuit, i.e., the driver’s voice coil (Fig. 8). In the graph, the topmost trace is that of Revc, which clearly indicates that Revc is the point in the circuit where the most power is being dissipated. Here, Zevc represents the frequency-de pendent impedance of the driver’s voice coil, in ohms. This equation illustrates that increasing Rsource results in greater dB SPL losses. Given this fact, best practices dictate keeping Rsource as low as possible. From the preceding investigation I think it fair to draw the conclusion that amplifier DF has very, very little effect on the total circuit DF, and what little effect it does have occurs in only the very worst of cases. Online threads typically start with someone bemoaning the fact that their latest design, now made reality, can’t be placed next to their TV or CRT computer monitor without causing the display to become distorted. What to do? Soon there follows lots of well-intentioned suggestions— frequently possessing scant traces of technical merit—to shield or enclose the monitor or loudspeaker with a variety of metals. To sort the rubbish from the useful suggestions, I ran a series of Finite Element Analysis (FEA) analyses, each modeling a different suggestion on how to conquer video display distortion. My analyses will show, in the end, the old saw “an ounce of prevention is worth a pound of cure” definitely holds true where it comes to effectively corralling stray magnetic fields. The first simulation is that of a mag net/steel structure with its magnetic field free to fill the air surrounding it (Fig. 9). The squiggly lines surrounding the structure are magnetic field lines, scaled in webers. Any electrons streaming through the magnetic field (such as those found in an energized cathode ray tube) will be pulled off course, resulting in all sorts of image distortions. FIGURE 8: Power dissipation among the Rsource components. FIGURE 9: Unrestrained magnetic field. One solution, of course, is to keep that magnetic field from getting near the electron path. Moving the field source a sufficient distance from the CET gun would clear things up, as the farther the distance from the source the lower the flux density, but that only addresses the symptoms, not the underlying pathology. As well, space constraints may make putting enough space between monitor and speaker impractical. For my second simulation (Fig. 10), I modeled another common suggestion: place a shield between the loudspeaker and the CRT. In this case I placed a sheet of aluminum squarely in the path of the field and it did--just about nothing. Look at those lines—they’re having a field day (pun intended)! This looks like a sure-fire formula for disappointment, so obviously it isn’t a useful solution. The problem here is that aluminum is a non-ferromagnetic material with a relative permeability value nearly identical to that of air—thus it’s about as useful as air in corralling the stray magnetic field and preventing CRT image distortion. Display distortion continues virtually unabated. For my third simulation (Fig. 11), I modeled another common suggestion: enclose the loudspeaker in a container of some sort. In this case I used copper as the material. Once again you see the field is anything but corralled, which is just what you would expect using yet an- other non-ferromagnetic material. Copper has a relative permeability very close in value to that of aluminum, and the results from this PEA run reflect this. Any CET caught within the field surrounding the copper box would suffer distortions just as it would with the aluminum shield modeled previously. You could reasonably argue that other materials, such as steel, mumetal, and so on, could have been used to produce the modeled enclosure. But their effectiveness, practicality, predictability of results, and so on, when measured against cost and so forth still don’t make their use worthwhile. Besides, suppose you did find a material that could effectively shield the CRT monitor from the magnetic field surrounding the loudspeaker system. You’d need to encase the entire system in order to maximize effectiveness. And who wants to listen to a loudspeaker entirely contained within a metal box? Not very practical. In my fourth PEA simulation (Fig. 12) I modeled the magnet structure with a second magnet (also known as a bucking magnet) of the correct size, shape, material, and orientation placed up against the original magnet structure. Here you can see that the magnetic field is very effectively corralled, certainly far better than in any of the preceding simulations. Best practices here dictate that using drivers with a built-in bucking magnet already in place is the correct way to prevent CET-distorting magnetic fields getting at your TV or computer monitor. The bonus? 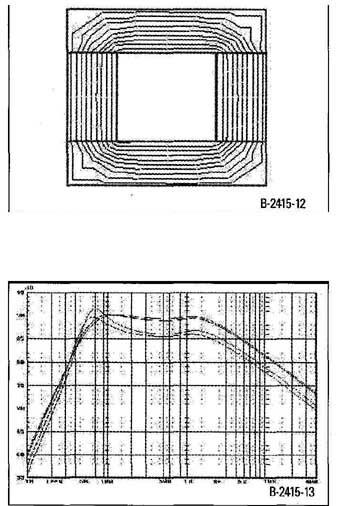 The presence of the bucking magnet can increase field density in the voice-coil gap, which, in turn, means increases in efficiency and lowered QES, as compared to its non-bucking equipped twin. 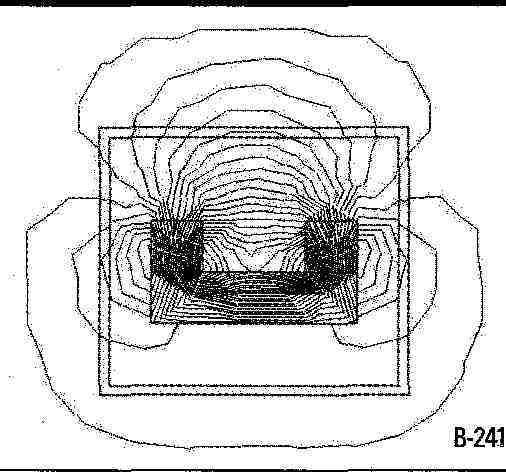 Conversely, placing a cup shield made out of a ferromagnetic material around the magnet assembly will typically result in a reduction in field gap density, which results in reduced Bi, efficiency, and increased Q all because the cup provided a lower reluctance path for the flux to follow than that within the voice coil gap. FIGURE 10: Magnetic field with aluminum shield. FIGURE 11: Magnetic field with copper box. 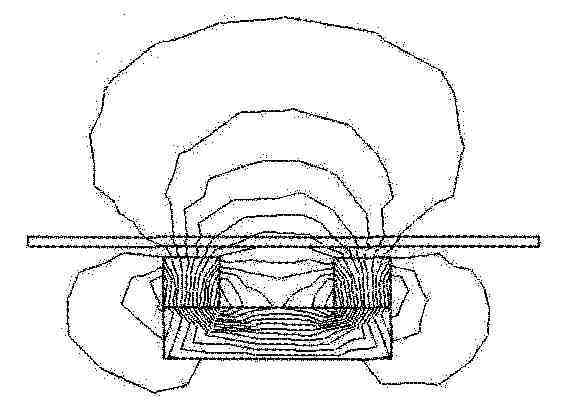 FIGURE 12: Magnetic field with bucking magnet; FIGURE 13: System response resulting from voice coils made of various metals. Often found buried in online discussions of cables and interconnects is the contention that gold is the best conductor from which to make said items. Reality is, whether or not gold (or any other metal, for that matter) is the best choice of conductor depends on the application for which it is intended. I’ve put together a chart (Table 2) listing basic properties of several metals I’ve seen mentioned at one time or another in online discussions. From a material properties point of view, gold’s most outstanding feature is that it’s a noble metal and therefore does not react with the environment as the other metals do, which makes it a great choice where corrosion-resistant connectors are required. A quick look at the chart shows it is not the least resistive or lightest of metals either—two reasons you don’t see gold voice coils, especially when you consider that copper is less resistive, lighter, cheaper, and commonly avail able in wire form. To put the various metals into perspective-enhancing rankings, I constructed a chart which shows a variety of parameters for a theoretical voice coil, consisting of a 4-layer coil, wound with 30-gauge wire on a 2” former. Tref = reference temperature at which Rref is specified. …to determine resistance at various temperatures. 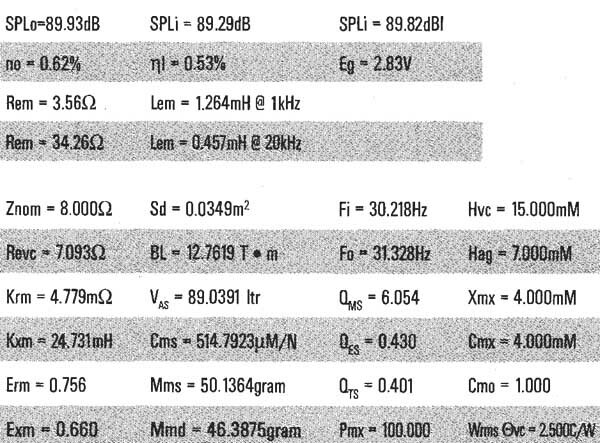 And in each case, as I mentioned previously, 30-gauge wire with) the dimensional properties listed in Table 3 is used. From Table 4, you can easily see that a voice coil made of either silver, copper, or OFC copper has a lower Revc than one made of gold. You can also see that these voice coils would be lighter than one made of gold. 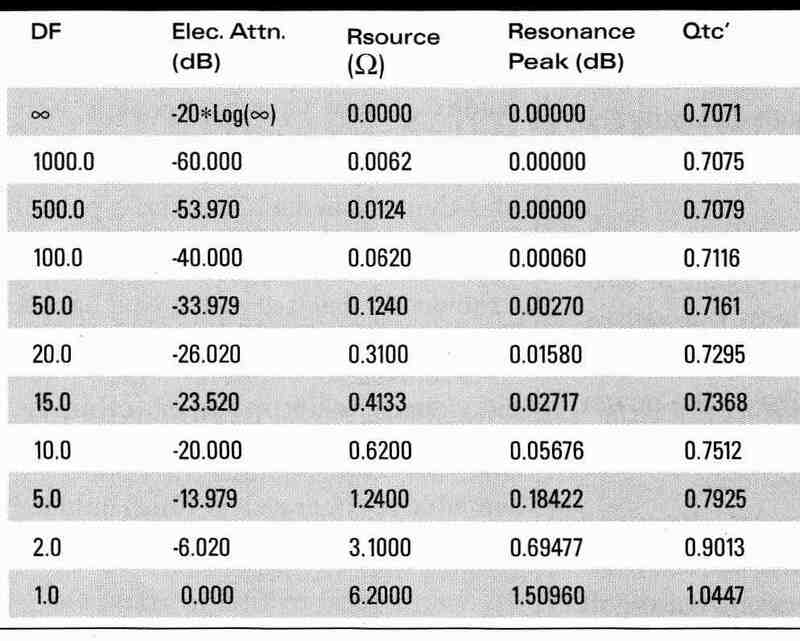 It is interesting to note that an OFC copper voice coil has a slightly higher resistance than the non OFC version. Silver, though the best conductor in terms of exhibiting the lowest resistance, isn’t often used as voice-coil wire because (aside from cost) the gain in driver efficiency as a consequence of lowered resistivity is more than offset by the loss of efficiency caused by the increase in voice-coil mass. Conversely, aluminum does find its use in tweeters because its comparatively lesser density makes for a lower moving mass voice coil, which offsets the decreased efficiency owing to its higher resistivity. I was particularly interested in seeing how the weight differences between voice coils made of the differing materials would affect system dB SPL response and impedance, so I ran five simulations in LEAP. In each case I held Revc constant, varying BL, Mmd (diaphragm mass, in grams), and let ting LEAP alter the remaining driver parameters. I then (virtually) placed them—one at a time—in the same enclosure and generated db SPL and impedance plots. It’s interesting to note in the dB SPL graph (Fig. 13) that when Revc was held constant, the drivers sporting voice coils made from aluminum and gold (the lightest and heaviest materials modeled) had a response —3db lower than those systems modeled with either version of copper or silver. Silver produced the highest reference efficiency system, but only a small fraction of a dB above either of the coppers. FIGURE 14: Metals properties table. 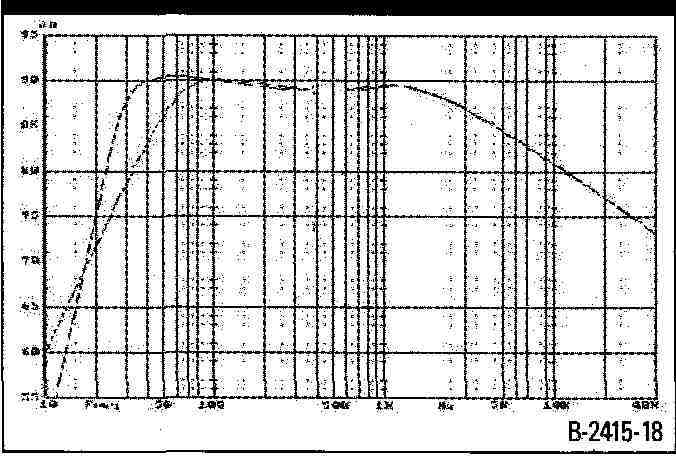 In looking at the impedance chart, you see the two coppers present nearly identical curves (Fig. 14). Aluminum had the lowest Zpeak (31 ohm) of all samples and silver had the highest (81 ohm). Gold presented an impedance peak located between that of aluminum and the two coppers. When you take into consideration other issues important in the manufacturing process (cost, availability, resistance to mechanical and thermal stress, solderability, and so on) and add them in to the equation with copper’s comparatively low resistance and light weight, it’s easy to see why it features so prominently in audio. Given the pre ceding analysis, I think it’s fair to say that for applications other than those requiring a high degree of corrosion resistance, gold is not the best conductor around, and in most other cases good ol’ I copper (OFC or not) is the best choice. Here’s one that’s been around far longer than any Internet online forum! To sort the facts from fiction, I ran five systems simulations in LEAP, using a driver with the specs listed in Table 5. In the first simulation, I modeled a totally enclosed box system, used as a baseline against which all subsequent modeled systems were compared. I then ran three subsequent simulations, each representing some permutation of the first baseline system. I then ran a fifth and final simulation, modeling a properly designed and tuned BR system. 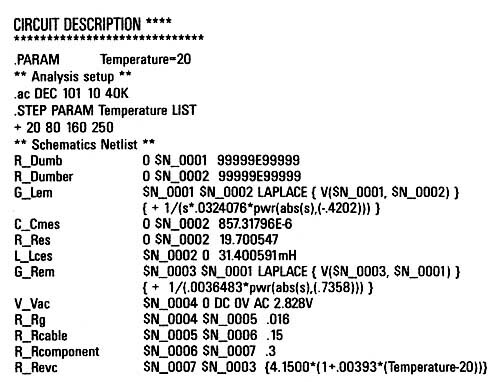 The modeled systems’ specs are shown in Table 6. I started with a comparison of the baseline system to a system in which Vb was doubled, with all other design parameters held constant. This doubling of the net internal cabinet volume used for the baseline design did very little to change overall response and nothing in the passband reference efficiency region as shown in Fig 15. (As you read through the graph data, keep in mind that each vertical dB SPL axis is scaled in 1dB units). I then re-ran the simulation, this time modeling a system with a net internal cabinet volume ten times larger than that of the baseline system (Fig. 16). Even with a one order of magnitude in crease in net Vb, I observed no change in 1 of the system; it still hovers extremely close to that of the driver. Next, I took the baseline TEB system and virtually cut a port in the cabinet. The port modeled had a 0.75” depth, and a cross-sectional area of 0.5 * Sd (.017545 m^2). All other parameters were, as before, held constant. I then re-ran the simulation, producing the result shown in Fig 17. There are some noteworthy items in this graph. 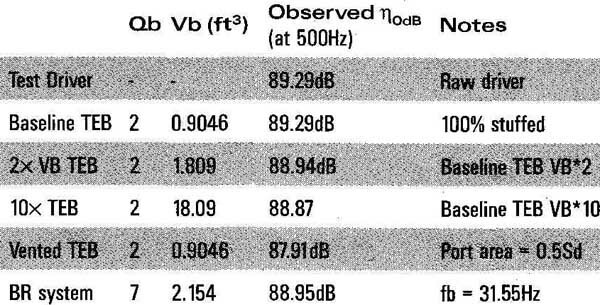 First, you see the mid-band reference efficiency of the ported system has actually dropped, while at the same time a - local maximum has appeared at just a bit above 100Hz. 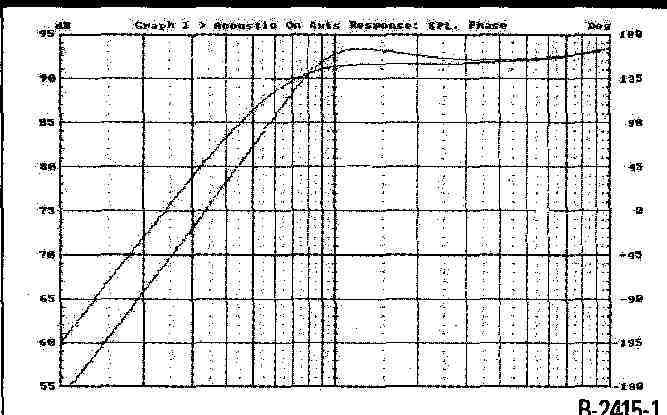 I’ve included beneath each graph an area under curve (AUC) value generated by performing an integration on the response plot from 10Hz to 40kHz. The | lambda | value represents the absolute value of the percentage difference found when comparing the AUC value of the baseline TEB versus each of the other four systems modeled. I included the AUC as had there been any substantial differences in the resulting simulation 0dB values, it would have shown up as a | lambda | far larger than the vanishingly small values shown. Last, I compared the baseline TEB response with that of a BR system, featuring, as in each preceding case, the test driver specified above (Fig. 18). Here you observe the bandwidth extension which you would expect for a properly designed and tuned BR cabinet. Once again, there is no change evident in the observed passband T value. From these graphs you can conclude that simply cutting a hole in a TEB cabinet or increasing the size of the cabinet will not increase values. You’ve also seen that, in some cases, such modifications can slightly decrease system eta dB. You’ve also observed you can design a TEB and BR system with the same driver and come up with a BR system that sports an extended LF response when compared with that of the TEB, but that won’t change the T value observed in either system, as the graphs clearly indicate. An increase in band width—yes, but a change in reference efficiency—no. To understand why, for each of the systems modeled, the eta 0dB values determinedly remained within a small fraction of a dB of the test driver’s reference efficiency value, take a look at the mathematical underpinnings of driver and system efficiency. You’ll also see why system ii hovers near or below driver but never exceeds the driver’s eta 0db value. FIGURE 18: Response plots for base line TEB and BR system. For closed box systems, k maxes out at . This figure represents a maximum performance limit and can be reached only by employing a lossless system, based on the C2 alignment. 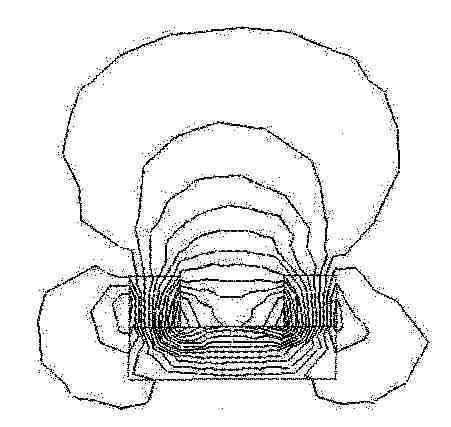 This figure represents a maximum performance limit and can be attained only by employing a lossless vented system, based on a k = 0.5, C4 alignment. In all three cases, you can convert 1 values to power sensitivity in decibels by. where both PA and FE are in watts. The two system reference efficiency equations say that enclosure volume, cutoff frequency, and maximum reference efficiency are interdependent. Small refers to this as the “Efficiency Bandwidth-Volume Exchange.” Given the alignment type and losses present, can be maintained while altering either 13 or Vb only by altering the value of the remaining factor. Want a lower 13? You’ll need to increase Vb. Want a smaller cabinet? You can expect 13 to rise, presuming, of course, that you want to maintain a particular i value constant (or ratio of acoustic power out to electric power in). Keep in mind that the calculated system i values represent an ideal performance maximum: the best you could hope for, given a specific alignment resulting from a specific design for a specific driver. In practice, actual system 10 values are lowered or constrained by such factors as driver mechanical losses, enclosure losses, and employing alignments other than those mentioned previously as being maximally efficient. Therefore, it’s not difficult—by choice or chance—to design a system that exhibits a lesser actual value. Loudspeaker design is a study in artful compromises; what you trade away in one area to gain in another depends upon, among other things, what your design priorities and goals are. If, in this case, for a given driver every de sign permutation you model delivers insufficient values, the only way to increase the values would be to switch to a more efficient driver. Above resonance, but below fh, the driver is operating in its inertial mass- controlled reference efficiency pass band. As such, in this portion of its out put spectrum, the cone is mass-limited and the driver functions as a constant acceleration device, producing constant volume velocity. An enclosure does not change the mass of the driver cone, so it cannot affect efficiency as con strained/controlled by cone mass. The air within the cabinet does not provide resistance to the motion of the cone; if it did, varying cabinet size would pro duce varying observed eta 0dB levels. You do not observe such variations across the five simulations (even in the case where cabinet size is increased by a factor of 10). FIGURE 19: Bandpass response of a generic electromagnetic driver. Given that a driver’s reference efficiency is taken from the mass-con trolled region of its response, a driver’s efficiency is independent of an enclosure’s volume, whether or not said en closure is vented. Neither does an enclosure alter a driver’s Bl, Sd, or Mms. So essentially you see no real variations in eta 0db levels across each of the five simulations because the cabinet does not affect or otherwise alter the driver parameters that determine its reference efficiency. Hence you never see a system sporting 11 levels greater than that of the driver, but given a variety of factors you can see a cabinet/driver combination that lowers T levels that could otherwise be attained. ...would be infinitely stiff and completely massless. I think this myth has survived as long as it has because, at first glance, the assertion seems to make sense; after all, a driver that is infinitely stiff and has no mass should have no problem responding perfectly and instantly to every electrical impulse fed its in puts, right? 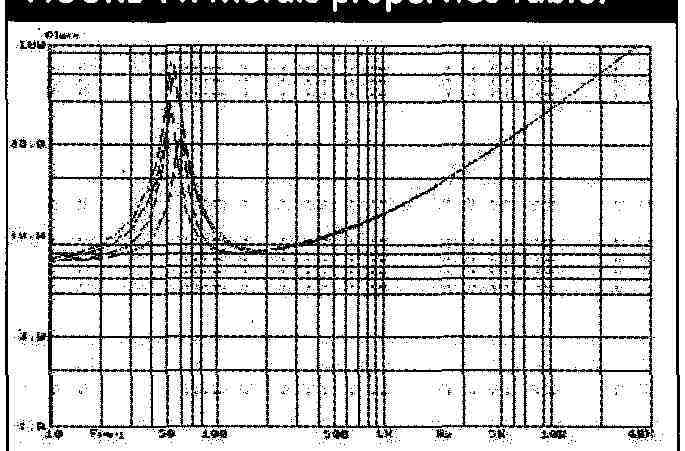 Let me show you what a bit of examination behind the scenes of the typical bandpass response of moving coil driver turns up (Fig. 19). You can divide the response curve roughly into three regions, each demarcated by fl (lower resonance) and fh (upper resonance). 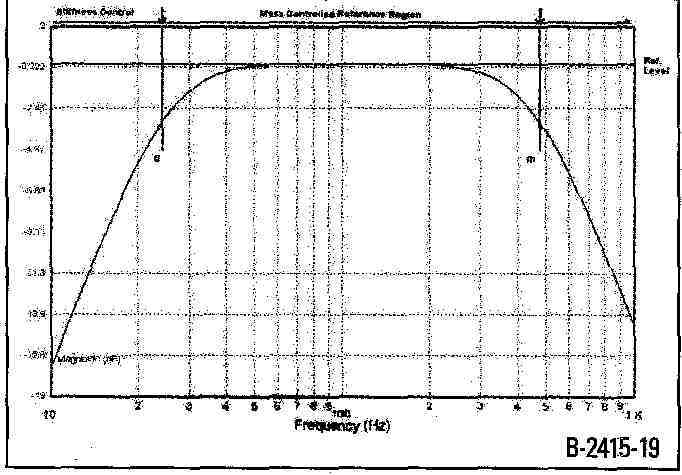 Below fl, stiffness (or its inverse, compliance—as supplied by the driver’s suspension—expressed as Cms) predominates in limiting the motion of the cone and output is proportional to frequency (see Joseph D’Appolito, Testing Loudspeakers), which, below resonance, means a rolloff of 12dB/octave as frequency drops. In this region the driver functions as a constant excursion device. Between fl and fh is the mass-controlled reference region of the driver. In this portion of its output spectrum, the cone is mass-limited and the driver functions as a constant acceleration device, producing constant volume velocity. Radiation remains essentially hemispherical and directivity, constant. So where’s the problem with the in finitely stiff/massless driver? By setting stiffness to infinity, fl is pushed up to infinity Hz (besides sounding painful in an abstract sort of way), which means that since response rolls off at 12 per octave, by the time frequency has dropped to within the audible range response is - dB down, hence no output. Above fl = infinity, the incredible driver is, predictably, functioning as a constant acceleration device generating a flat frequency response, but as it’s all happening at a frequency of infinity Hz, there’s no audible output. The perfect driver remains—as far as human hearing goes—silent. There exists a whole host of other technical issues that would contribute to the driver’s zero output (e.g., out-of-phase cancellation), but just focusing on Cms 1/8 and Mms = o are, in and of themselves, sufficient to silence the myth. Ferreting out the facts behind a myth—or any facet of loudspeaker de sign, for that matter—can be enjoyable, satisfying, and enlightening. Like a detective story in which every clue is important, you can find yourself developing an almost childlike curiosity when investigating the facts using whichever tool you have at hand: mathematics, CAD, your calculator, or a workbench with a bunch of analog test gear on it. The Internet, while providing forums for the propagation of audio myths, is also a formidable tool in providing many resources useful to sorting facts from fiction. Perhaps the greatest benefit of all such research is that, in the end, you can only gain in understanding.